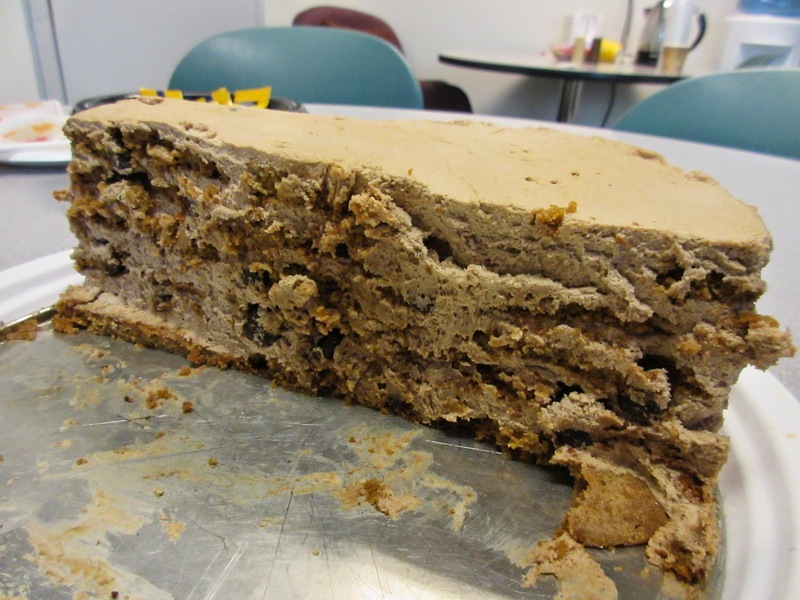 Half a Mocha Icebox Cake is better than none! We've had Tate's cookies many times. They are sold nearby and every now and then they are a fall back cake hour treat. Today was the first time we had them as part of a cake!! This time of year people go to parties and bring something like a dessert. To prevent the host from ending up with a bunch of half eaten desserts at the end of the night, savvy party givers will send the stuff back with the folks who brought it for their own enjoyment. I suppose if you go to a lot of parties like this YOU end up being the person with a bunch of half eaten desserts. What if they don't like it and I have to take it home? We presume this is what it looked like! 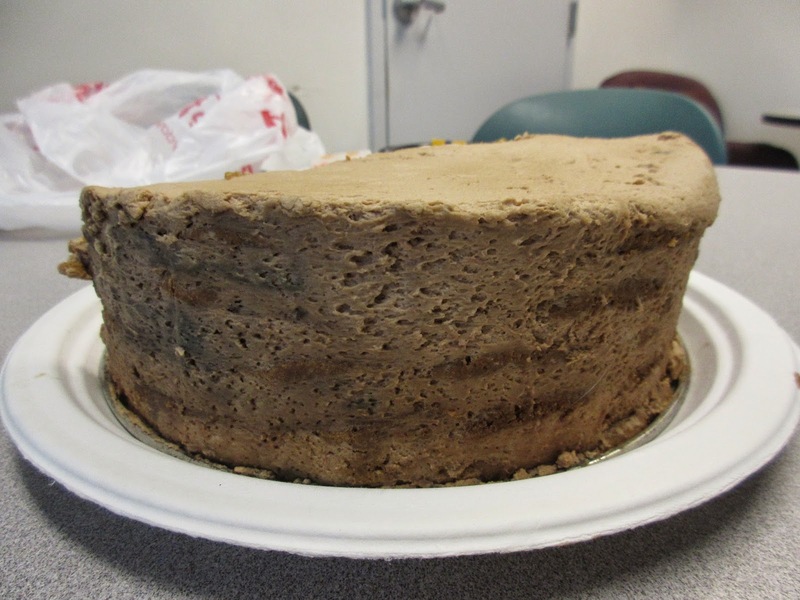 This is the type of cake we like because it is filled and frosted with a whipped cream base. 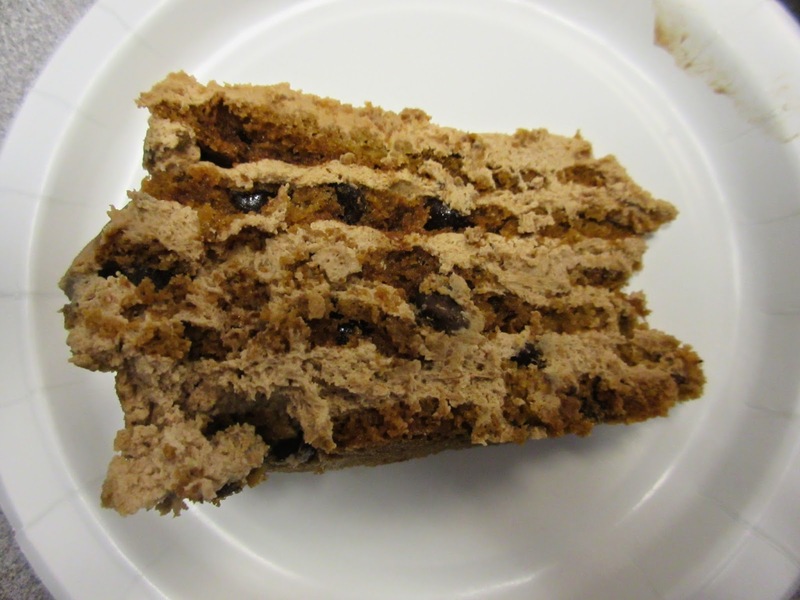 In this case it is a mocha whipped cream that also has mascarpone cheese - a little tira misu touch. Once you prepare that, instead of a baked cake base you use Tate's chocolate chip cookies to make the layers. What a great idea!! We can see the resmblance! 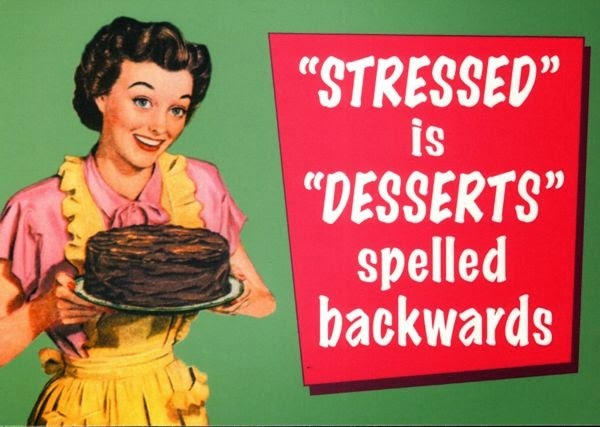 Half a cake is better than none! Tate's Cookies make the layers - genius!! It assembles pretty quickly and then it is chilled and you are done. We like this a lot as the cookies get a little soft and go very well with the mocha whipped frosting. It might not have been finished off at the party, but we killed it at cake hour! It went away pretty fast! 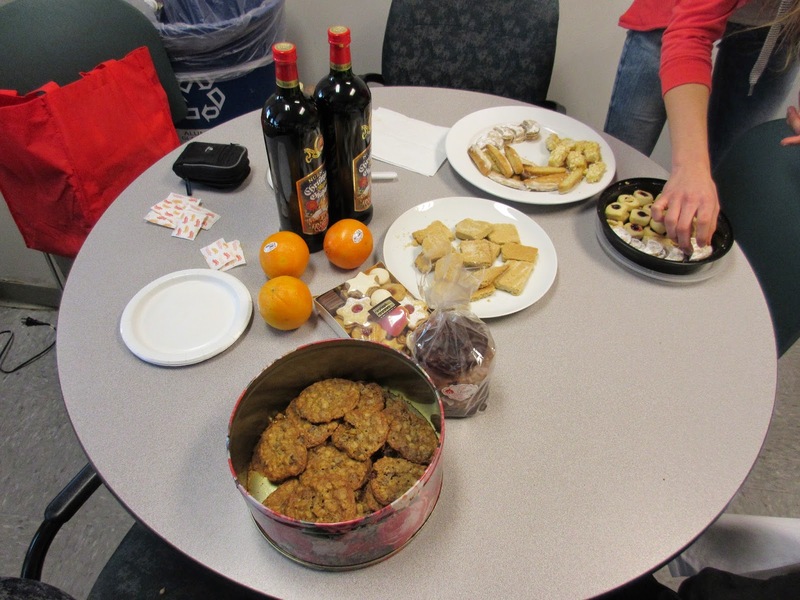 One of our yearly cake hour events is when we have the traditional Christmas Glühwein. This is the hot spiced wine that is a big treat when trolling around the Christmas markets in the cold weather. 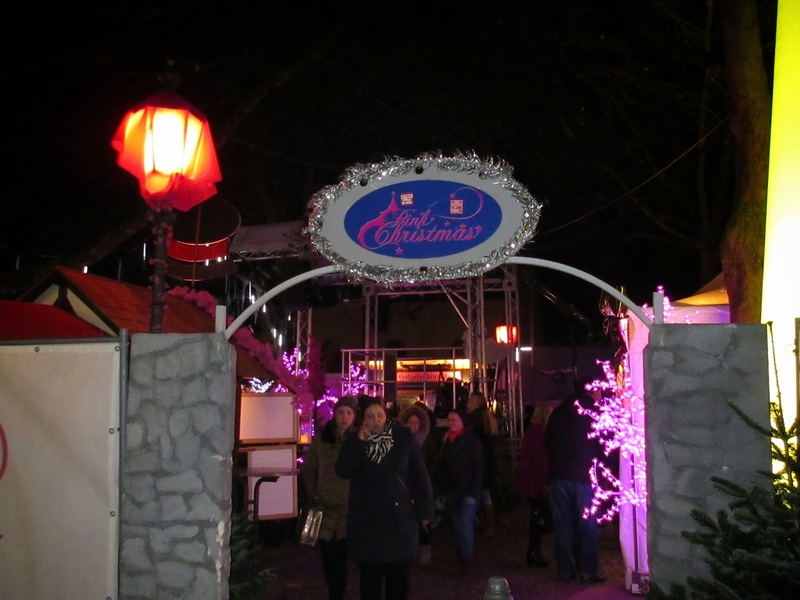 This year we made a trip to Germany and visited quite few of the markets in Munich including their pink or LGBT Christmas market. There wasn't much going on there but still it was fun to see. Entrance to the pink market! It wasn't as bustling as the others but it was pink! 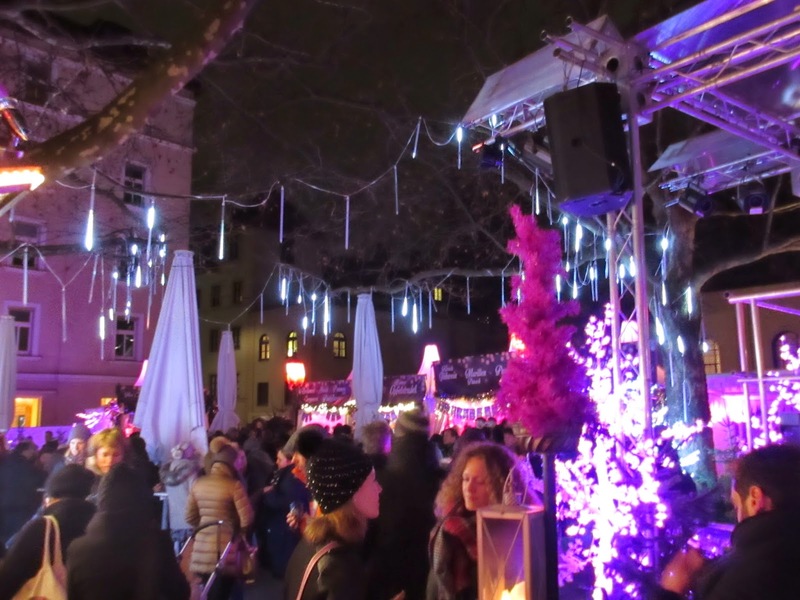 We hit two of the popular Glühwein stands - the one outside the Frauenkirche in Munich and Omas Glühwein stand in the thick of the market. Both are good and fun to see. 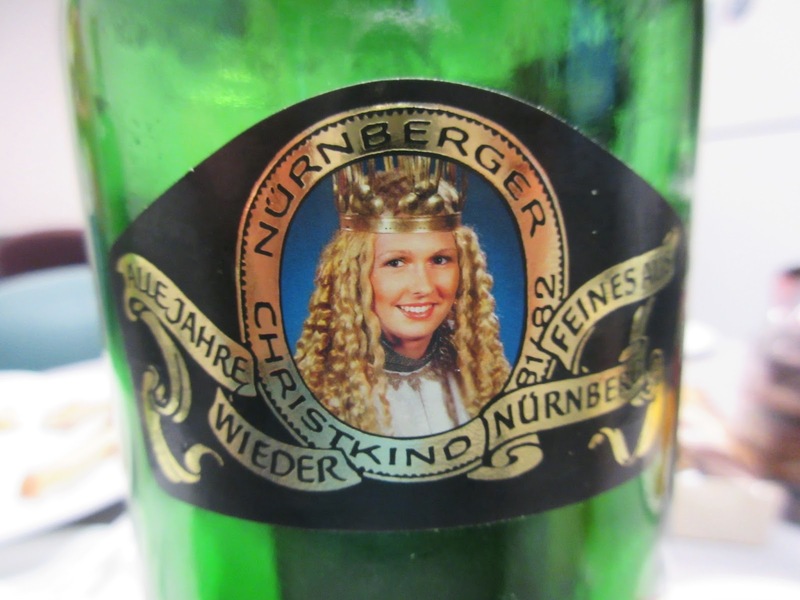 While tasting the Glühwein at Omas another patron passed around a tin of Christmas cookies which was a nice touch. It get you right into the holiday spirit. Oma does not mess around with Glühwein. 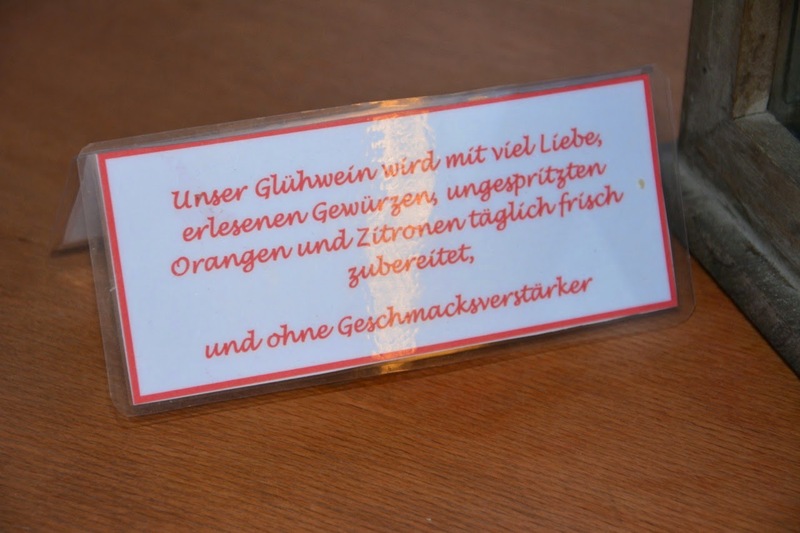 The card at each bar table says: "Our Gluuhwein is prepared fresh daily with much love, exquisite spices and unsprayed Oranges and Lemons. Also with no flavor enhancer." Sound like you have to give it a try! Notice the twin towers of the Frauenkirche on this stand! A perennial favorite is Oma's or Grandma's! Oma takes Glühwein very seriously! 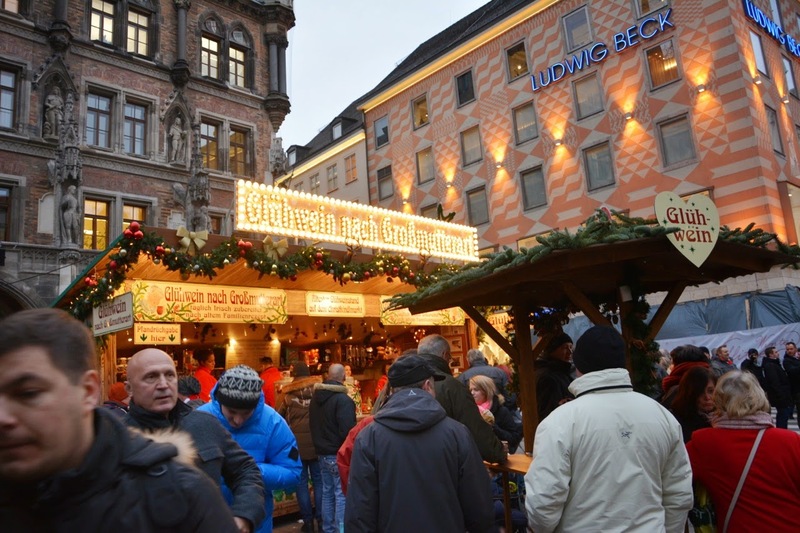 One of the most famous Christmas markets is in Nürnberg. 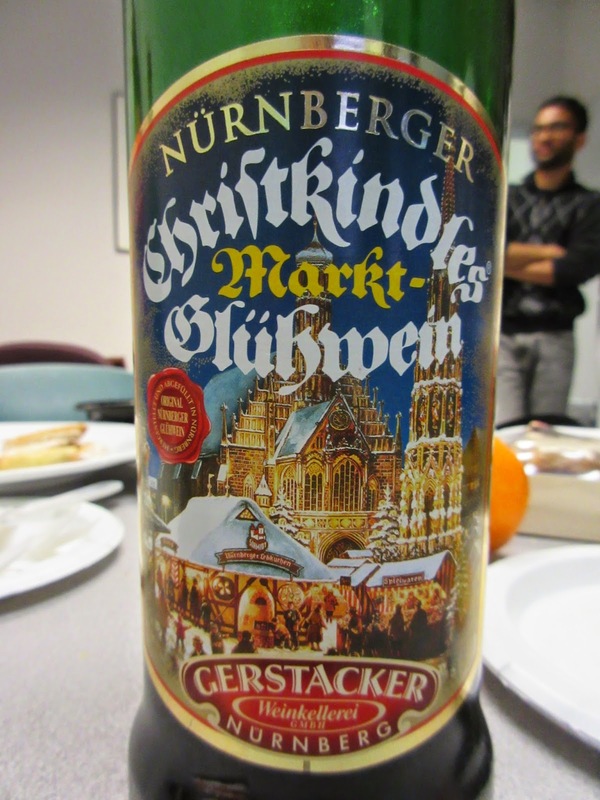 I happened to see some Glühwein from the Nürnberger Christkindlmarkt in a local store so I bought some to bring back to the States for our lab celebration. 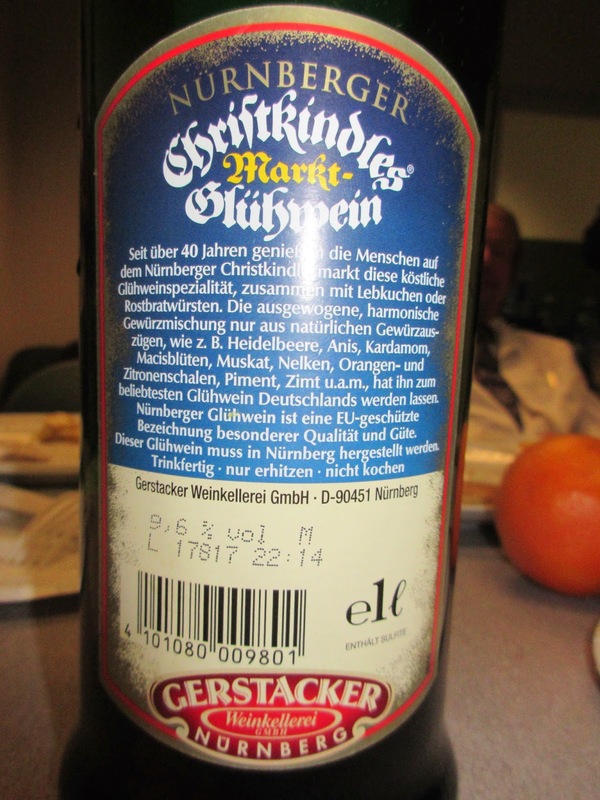 On the back of the bottle it explains : For over 40 years, people at the Nuremberger Christkindl market have enjoyed this delicious Glühwein specialty together with Lebkuchen or roasted bratwurst. 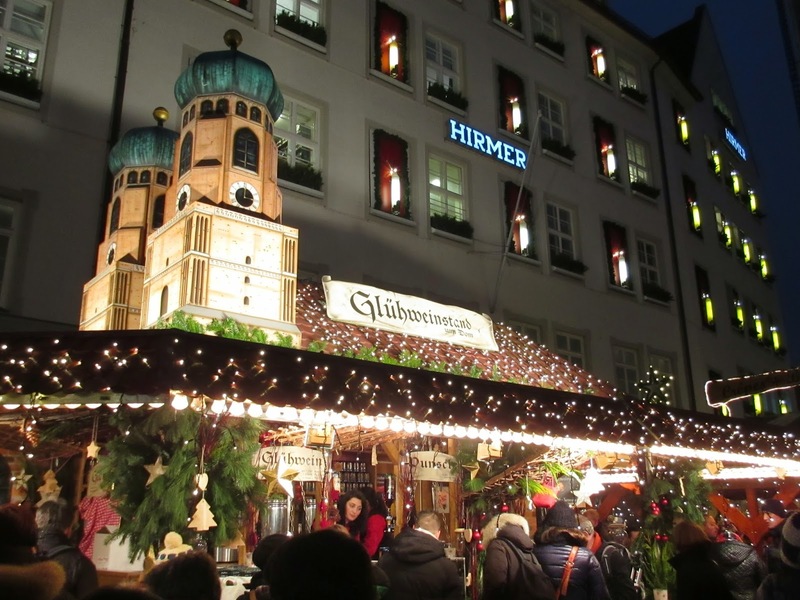 The balanced and harmonious spice mixture, only from natural spice extracts, for example blueberries, anise, cardamom, mace, nutmeg, cloves, orange and lemon zest, allspice, and cinnamon among others, has allowed it to become the most beloved Glühwein in Germany. This is the human embodiment of the Christkind at the Market! The most beloved Glühwein in Germany!! 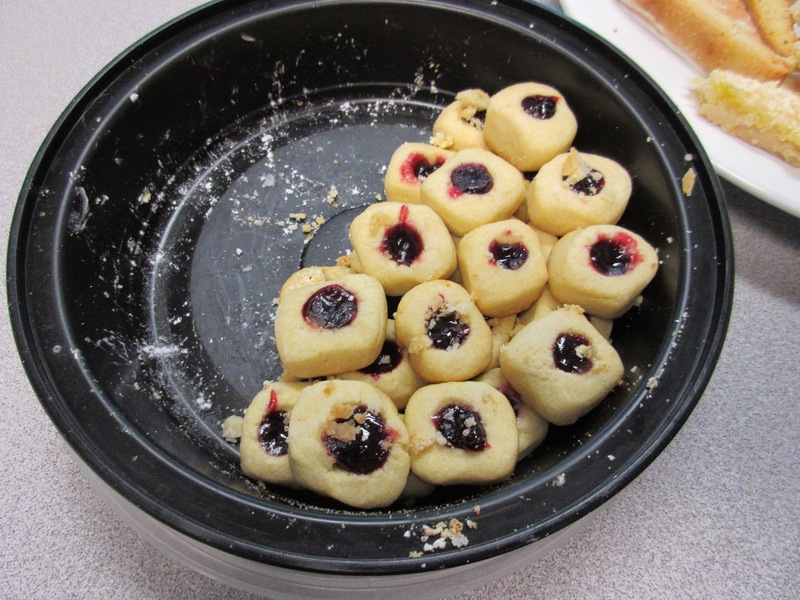 As mentioned before, in Germany at the holidays they feature Plätzchen - their version of holiday cookies. These tend to be more bite size but very varied in what they are made of. I brought some back to go with the Glühwein but did not have to serve them. 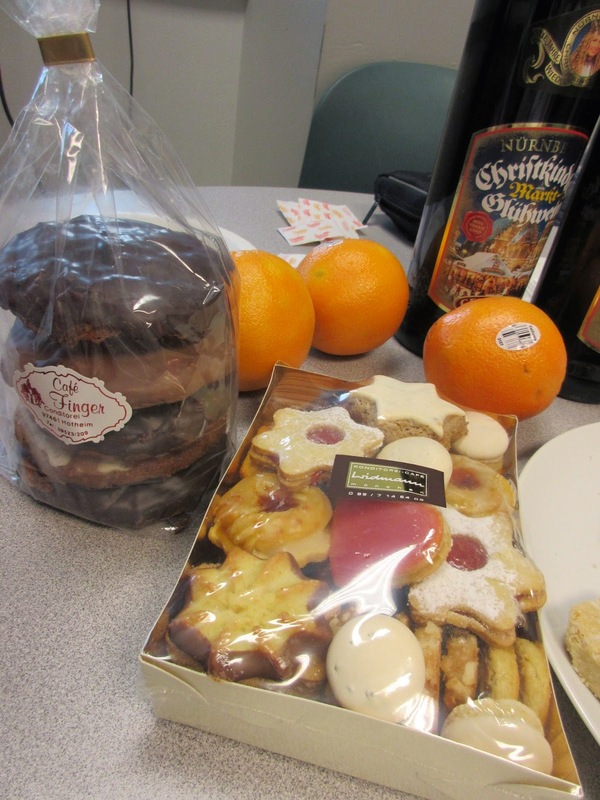 We had an intern - sort of - from Germany who baked a bunch of Plätzchen in anticipation of our cake hour. Since we had the real thing I didn't have to break out the commercial stuff although they are very good. 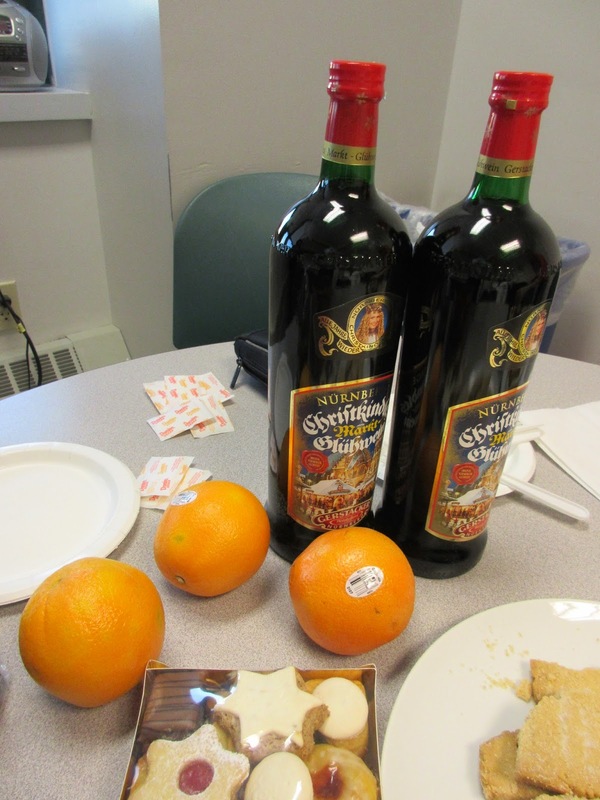 The oranges go with the Glühwein. Some American "Plätzchen"!! 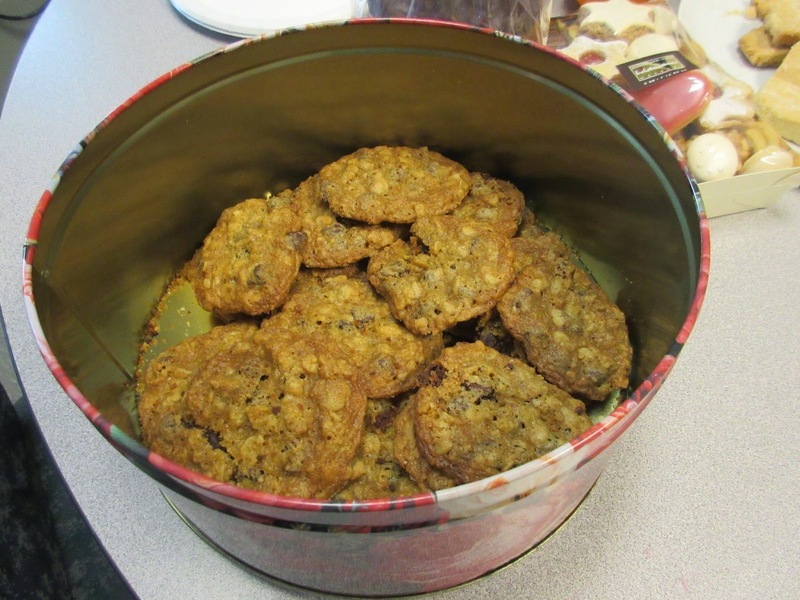 Oatmeal chocolate chip cookies! Brought this stuff back but it was unnecessary!! 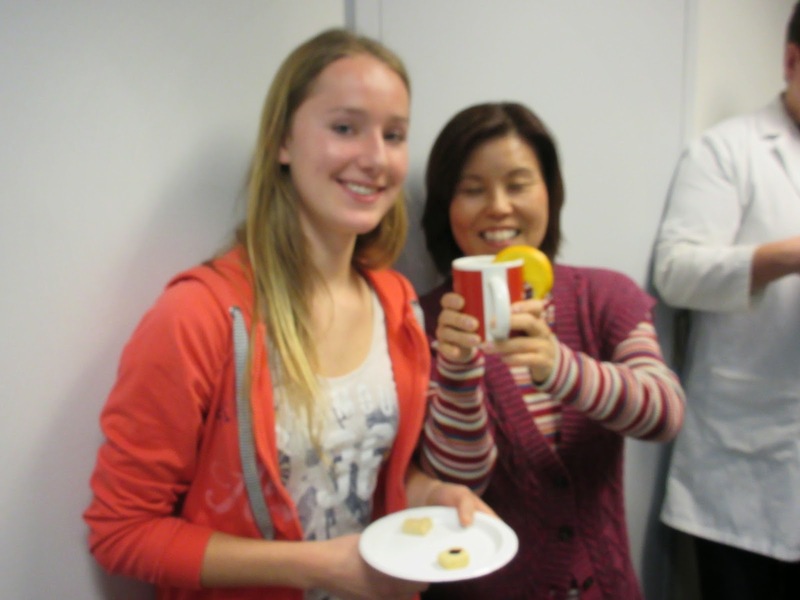 Our baker from Germany, on the left, did some baking!! 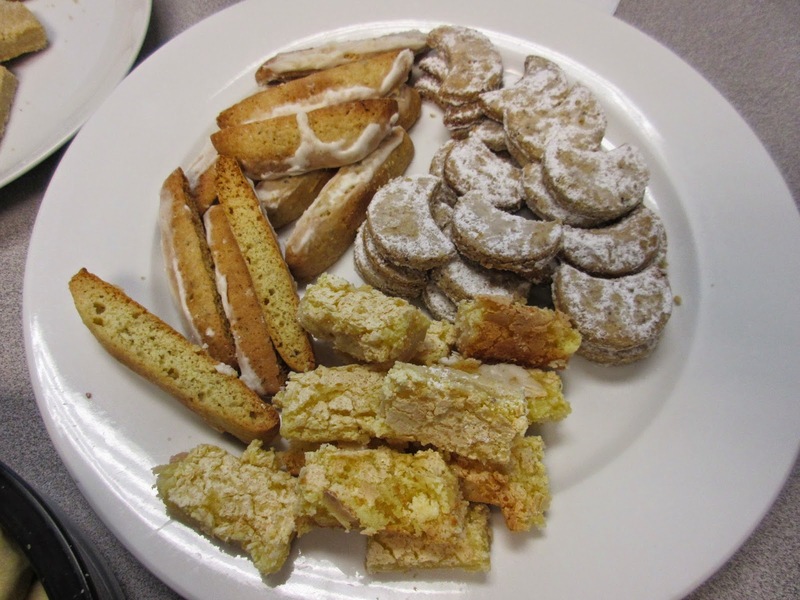 Half moon shape butter shortbread and Italian almond cookies - homemade!! So our Glühwein cake hour was especially authentic this year though we still should be standing out in the cold some where for it to be truly genuine. He got his citizenship and brought in a pie!! One of our colleagues originating in Hungary has been with us for over a decade. You can safely assume he is in no rush to get back there. Over the years he has gone from work visas to a green card. Finally the time for citizenship came so he can vote in elections and go through the quicker lines at airport immigration...among other things! He passed his citizenship test awhile ago and yesterday was the swearing in ceremony. 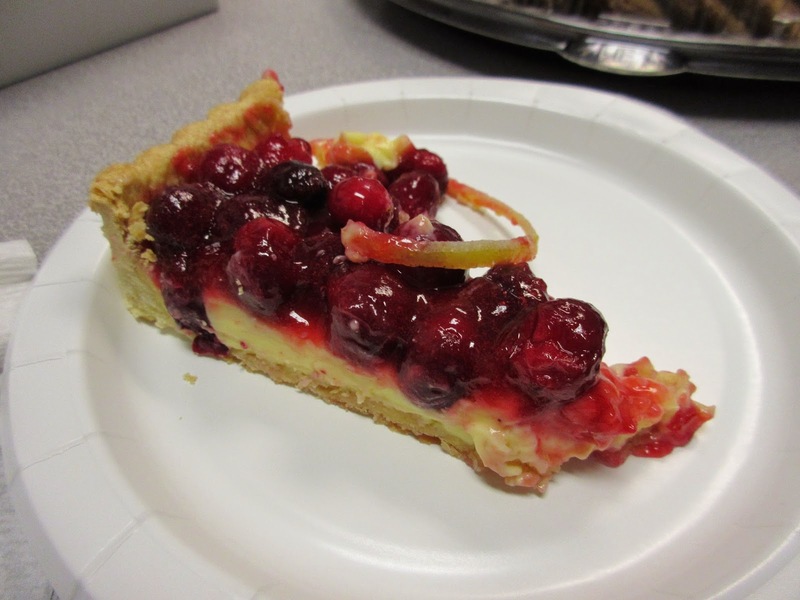 To celebrate his becoming a full fledged American citizen he brought in an all-American Cranberry Orange tart from Pasticeh. An apple pie might have been even aller-American but we are not complaining. Cranberries are uniquely American and this is a very special treat. Partially eaten by the time the photographer arrived! 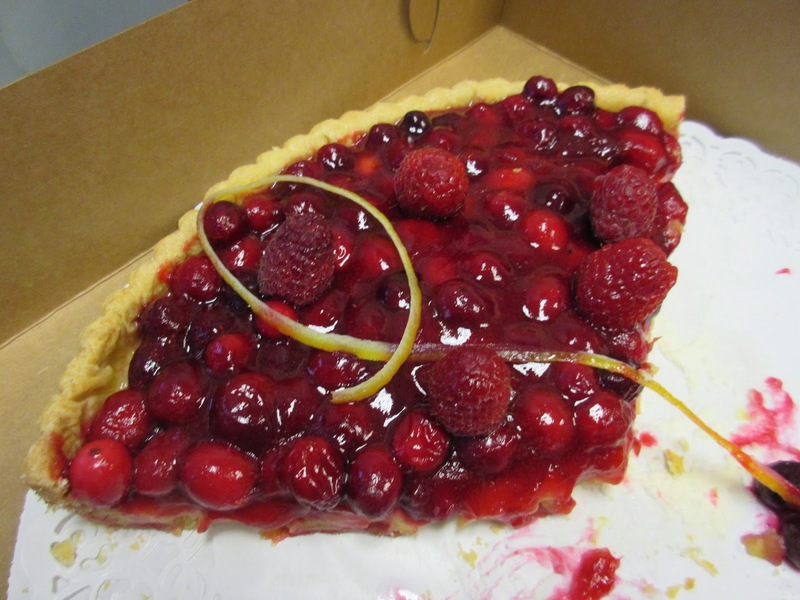 The layers of pastry cream and the glaze cut the tartness of the berries! 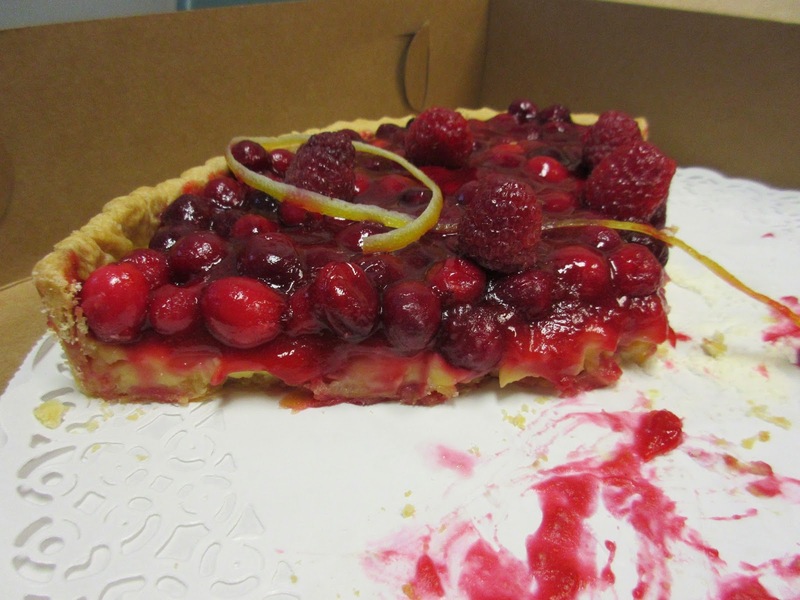 This tart, which we have had before, is delicious and hard to believe that the sourness of the berries is not at all overwhelming. 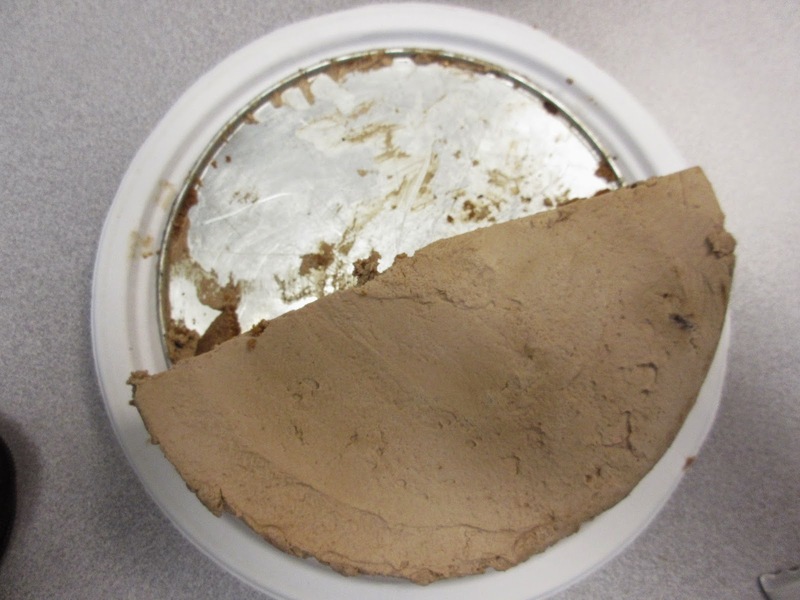 The pastry cream layer and the glaze probably offset the tartness. We were very happy to eat some and welcome our former Hungarian into the American fold!